Labranzagrande is a municipality in the Colombian Department of Boyacá, part of the the subregion of the La Libertad Province. It became a municipality on 1 April 2008. 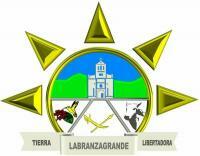 The flag of Labranzagrande is horizontally divided blue-green with white triangle at the hoist. The triangle is charged with twelve red stars in semi-circle. Translated from municipal web site: "By Special Act passed on 7 August , following Municipal Decree No 013 of 28 May 2008, one of the municipal emblems is the flag, as selected by the jury of the competition launched by the Municipal council in February this year. The flag has for chatacteristics a green stripe, a blue stripe and a white triangle charged with 12 red stars." The 12 stars must represent the central borough ("Barrio centro") and the 11 rural hamlets ("veredas") of Chaguazá, Cuazá, Guayabal, Hato Viejo, Ochica, Salitre, Suacia, Tablón, Tocaría, Uchuvita and Usazá.